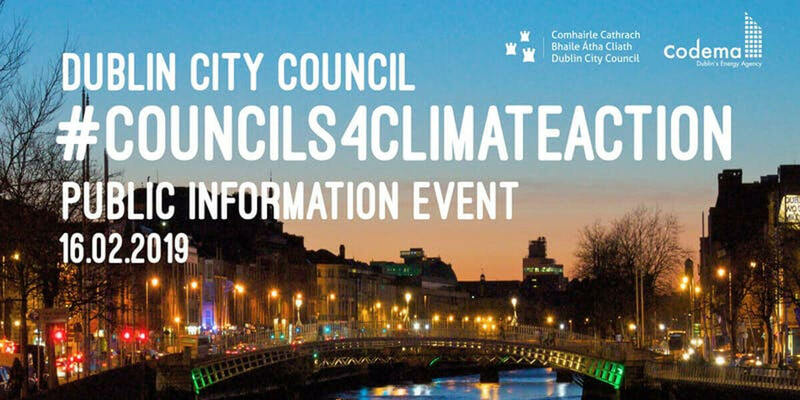 Dublin City Council is delighted to invite the public to its #Councils4ClimateAction public information event, which will take place as part of the public consultation process for the Council's Draft Climate Change Action Plan 2019-2024. This event will give you the chance to see the actions the Councils are taking or will take to reduce their emissions and make the city more adaptive to the impacts of climate change. The Lord Mayor of Dublin, Niall Ring, will give the official welcome address at 12.30pm and the launch of the Dublin Climate Action Regional Office will take place directly after.